Fall = temperatures dropping, leaves turning, pumpkins and squash. And then there's soup. There's something therapeutic about simmering soup on a cool day. Does the fact that I made soup twice in the past week mean I need therapy? I'll have to think about that...It's a simple dish to make, and if you pair it with a good roll and salad and you've got a filling meal for a cool evening. Are you thinking, that's great for me. But how will I get the husband/kids/males in my house to eat it? One word. BACON! The recipe calls for cooking a slice of bacon (yes, just one...not in my house lol) and laying it across the cup or bowl before serving. Brilliant. Bacon has magical powers. I cooked a few slices and they almost all disappeared before I served dinner. Throw bacon on anything, and guys will love it. Bacon makes everything better. Cook bacon over medium heat in large pot, flipping once, until brown and crisp, about 15 minutes. Drain on paper towels; discard fat from pot but do not wipe clean. Melt butter in pot over medium heat. Cook onion, stirring occasionally, until softened and golden, about 15 minutes. Add squash, thyme, 1 tablespoon salt, broth, and water; increase heat to high and bring to a boil. Reduce heat, cover, and simmer until squash is tender, 12 to 15 minutes. Discard thyme. Working in batches, purée soup in a blender until very smooth. Return soup to pot and season with salt and pepper; cover to keep warm or reheat if necessary. Divide among heatproof glasses and garnish each glass with bacon. I opted to lay the bacon right on top of the soup with a few seeds I toasted and salted from the squash. 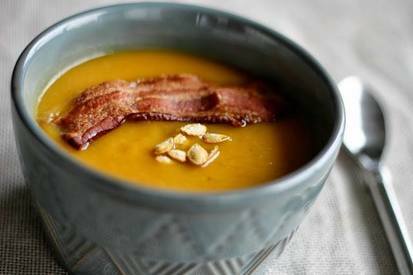 Bacon and soup can be made up to 3 days ahead, cooled completely, and stored in refrigerator in separate containers. Recrisp bacon on a baking sheet in a pre- heated 300 ̊ oven, about 10 minutes, while reheating soup over low heat. -I used my immersion blender and pureed the soup right in the pot. One pot cooking, hooray!